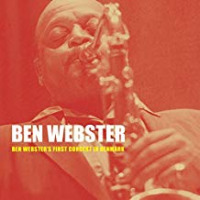 Ben Webster refused to fly. When he visited Norway from Denmark, his adopted homeland, he went by boat and when he got there would blame his somewhat uncertain gait on his "sea legs," rather than the large amounts of alcohol he had consumed in the vessel's bar. Sometimes his "sea legs" were so bad, initial concerts had to be rescheduled. 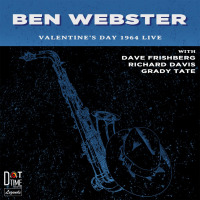 However, by 1970, when this date was recorded, Webster was 61 and slowing down just a little. Either that or the long, dry ride north to Trondheim had a sobering effect. You never know, he might even have felt a certain obligation to his hosts, who treated him to conducted tours of Trondheim's Nidaros Cathedral and the wondrous Museum of Music and Musical Instruments in nearby Ringve. One way or another, no sea legs. Instead, 11 immaculately performed standards, five of them from the repertoire of Duke Ellington, who gave Webster his first break. There's a laidback version of "Cotton Tail," his feature number with Ellington that's so blissful it makes those stories of the break-up, in which Webster is said to have cut up one of his leader's suits, doubtful. Still, not for nothing was he nicknamed "Brute." Back in the days when he did fly, Webster was en route to a gig in LA with the Ellington band when the pilot woke him to warn of turbulence. If there was one thing Webster hated, it was having his sleep interrupted. He drew back his fist and floored the fellow. Fortunately the pilot recovered in time to make a safe descent. On the sleeve Ellington is wrongly credited with writing "How Long Has This Been Going On?" It was, of course, penned by George and Ira Gershwin. Webster is at his relaxed and confident best, occasionally shouting joyous encouragement at pianist Tore Sandnaes, who was woefully under- recorded by whoever taped the concert. Worse still, on the closing number, Rodgers and Hart's "My Romance," after Webster has stated the theme, Sandnaes suffers the ignominy of being faded out. A shockingly abrupt ending. Otherwise, though, there are no surprises. With just four years left to live, Webster did what was expected of him and with seemingly effortless grace. Of course, it wasn't effortless at all. Brute was a giant, up there with Coleman Hawkins and Lester Young. That took a lifetime of hard work. He made it sound easy, that's all. Track Listing: In A Mellotone; How Long Has This Been Going On; Sunday; Star Dust; Perdido; Satin Doll; I Got Rhythm; Danny Boy; The “C” Jam Blues; Cotton Tail; My Romance. 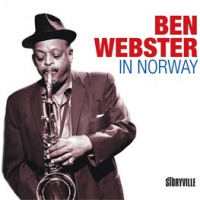 Personnel: Ben Webster: tenor saxophone; Tore Sandnaes: piano; Bjørn Alterhaug: bass; Kjell Johansen: drums.